K and I are staying in a very nice cottage between the school and town. It is called the Holumba. Here is a photo of our cottage. 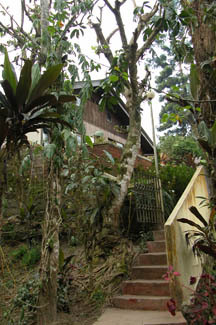 The caretakers and owners have about 5 cottages on the property. 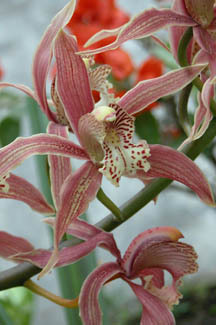 They also cultivate many varieties of orchids. Kalimpong is about 4500 ft.in altitude and is in the foothills of the Himalayas. Here is a photo from our patio on a clear day. 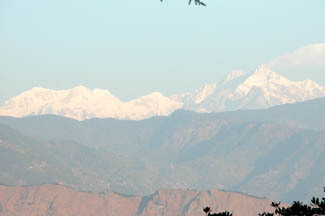 You can see the mountain range with Kanchenjunga, which is the third highest peak in the world (28,169 feet). It is the triangular shaped peak to the right in the photo below. Apparently, there is some contention regarding the hierarchy of peaks. Click here for more information. We actually saw Mt. Everest from the airplane during our flight from Delhi to Bagdogra! It was poking its head above the clouds below our aircraft (and not that much further below, at that). There are many animals roaming around the Holumba. The owners have ducks, geese, rabbits, guinea hens, dogs, chickens, and probably others we haven’t seen yet. 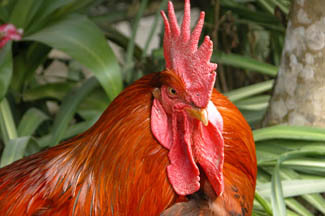 A very stern looking Mr. Rooster. He starts his song at 3:00 a.m. on most mornings! On the first day, a little dog (who lives across the street, as we later discovered), came to visit. We call him the Holumba Pup. 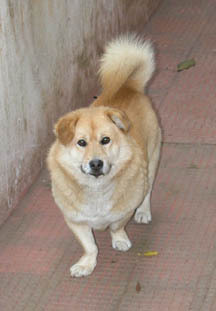 He has tar in his fur from the perpetual paving of the road due to damage from the previous monsoon season. In addition, it looks as though he broke his right front foot at some point. One of his teeth actually protrudes through his cheek. He is very affectionate and sweet. Your photos are fabulous. The dog makes me think that you are probably missing Mabel, Hillary, and Earle the pearl. We look forward to your return soon. Thanks! Yes, we miss our lovely beagles. When we left today for the van ride to Bagdogra and flight to Delhi, we were able to see Kachenjunga one last time. I think it’s about 29,000 ft. high. More about Delhi on the Delhi page.